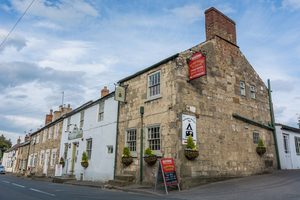 The Yorkshire Hussar Inn, named after the Yorkshire Hussar Regiment - 'Hussar' meaning Mounted Cavalry - formed on 13th August 1794 was based in Northallerton. Mr. & Mrs. James Brayshaw bought the Pub in Feb 1947 from Mr. & Mrs. Johnson, 'Jim & Ishbel' moved into the Pub in May 1947 and later developed the Caravan Park in the 1950s. We know the buildings date back to the 15th century but did not become a public house until 1850, before then the Bar was a Butchers Shop and the Lounge was a Blacksmith Shop & Wash houses for the adjoining cottages. 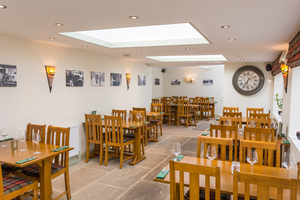 The Bar now refurbished in 2015 has original stone flag floors and beamed ceilings. The Pool Room was not part of the pub but a private house including the little passage area from the bar room window to the door into the pool room, now known locally as 'The Punch & Judy' area, this was a 'Larder' in the house. From the outside of the property you can see how the Poolroom has been attached to the lounge with a built on passage. The Pub Lounge in 1947 was originally the kitchen, but only half of it – up to the center beam. From there to the chimney, it was a Wash House for the four cottages. (ie Mr & Mrs Hunts house-now the pool room, Mr & Mrs Tinsley's House-now knocked down to make an entrance into the Site, Mr & Mrs Anderson's house-partly knocked down and now part of the reception, and Mrs. Patrick's house-the other half of the Reception. Jim and Bill Pearson converted the old kitchen into a Public Lounge in 1950. Today's Kitchen was originally 'The Brew House.' Where they brewed the beer. The Resturant Lounge was a stable, in fact we kept a horse in there during the early 50's, her name was 'Violet' and on loan to us from Cayton Farm to help us with all the alternations. The two bedrooms above the stables were one big function room with a cocktail bar used for parties and dances. The Car Park was not as large as it is today, gardens came down to the house in line with the Old Petrol Pump which was last used around 1970. We finally stopped serving petrol as the petrol companies refused to supply us with small quantities and we found we could buy it cheaper at other Garages than we could buy it in from the suppliers. In the early days the land was originally used for the growing of Barley to make the beer, we used it as a market garden growing produce such as cabbages and peas. We also kept pigs. The Idea of a Caravan Park was discussed over a pint of beer (as all good ideas are) with Mr. Heber Fox back in 1949, when he asked Jim if he and his brother could bring their little caravans here so that he didn't have to drive home to Batley. They stayed here for approx 5yrs but when Jim applied for a Site License for 11 caravans they decided to leave because that was too many vans! Jim later applied for 30 vans and again later for 75. The Park Reception was originally three outside toilets and coal sheds for the cottages which were converted in 1980, when Jim & Ishbel retired from the pub in 1982 allowing their son Peter to take over. The reception was originally run from the Pub Kitchen Door. Back in 1947 the only way to the rear of the property was through a narrow archway, shown on one of the photos in the pub. Around 1948/49 Jim first knocked down one house next to the arch – Mr. & Mrs. Tinsley house (Mrs. Tinsley being Daisy's sister) to allow motor vehicles through. Daisy worked behind the Bar before we bought the pub & only retired a few years ago. Later in 1964 we knocked down the arch to allow access for larger caravans which were getting bigger & bigger. Caravans today continue to get bigger and the only way for us to get the large 12ft x 30ft caravans in would be to knock down another house! The original beams that supported the old arch can be seen inside The Cross Keys Inn, above the lounge windows & over the fire place. But that's another story. Read more history on the Historic Markington website.